Ikaros is a Japanese spacecraft that was the first to successfully use a solar sail at some distance from Earth. 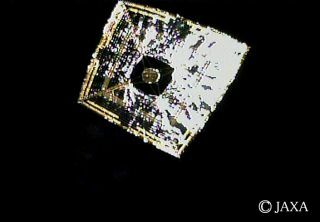 "The small solar power sail demonstrator 'Ikaros,' which successfully deployed its solar sail, was confirmed to accelerate by [the] solar sail receiving solar pressure," officials from the Japanese Aerospace Exploration Agency wrote in a July 9, 2010 update. "This proved that the Ikaros has generated the biggest acceleration through photon during interplanetary flight in history." Launched in May 2010, Ikaros demonstrated the effect that individual light photons have when hitting a solar sail. While each photon is small and only generates a small push, over time the accumulated energy from each one of the strikes pushes the solar sail (and anything attached to it) forward. Ikaros (an acronym for Interplanetary Kite-craft Accelerated by Radiation Of the Sun) launched aboard a Japanese H-2 rocket, riding along with the main mission: a Venus orbiter called Akatsuki ("Dawn" in Japanese). The spacecraft was expected not only to go to Venus, but also to take off on its own for a three-year trip around the other side of the sun. "To me it's a very bold activity to be conducting a technology test like this on an interplanetary mission," stated Louis Friedman, an executive director of the Planetary Society in Pasadena, Calif., shortly before the craft launched. "I think it shows a lot of foresight on their part." Ikaros successfully deployed its 46-foot-wide (14 meters) sail in June 2010 through an innovative method that took advantage of spin. The package slowly unfolded as it spun at about 25 revolutions per minute, pulled out by the mass of four weighted tips working in microgravity. The folded solar sail moved out into a cross shape, at which point the spacecraft unfurled the membrane. By July, JAXA was reporting the first push of photons on the solar sail. Akatsuki, as it turned out, did not successfully enter Venus' orbit, but controllers will make another attempt for a different orbit in 2015. Later that month, JAXA found that it could also control the orientation of Ikaros through using liquid crystal panels at the fringes of the sail. Electricity flowing through liquid crystal panels gives a reflection for the spacecraft to move forward, while turning the flow off makes the sunlight pressure more diffuse. By using the different forces of sunlight on the edges, Ikaros was able to change orientation. Testing in mid-July showed that Ikaros was able to achieve about 90 percent of the attitude control angle controllers expected before launch. "JAXA will continue the attitude control experiment by the Ikaros to evaluate the details of the attitude control performance while continuing to conduct research on attitude control technology using sunlight pressure as a technology that enables navigation for longer in time and further in distance by a solar sail," JAXA officials wrote in August 2010. All the expected tests of Ikaros finished up that December, but JAXA noted that it was planning to keep the spacecraft flying to do some developmental work. "IKAROS finished all experiments planned on Dec 2010 and is still continuing the first actual solar sail flying in order to enhance the skill of controlling solar sail," JAXA wrote. "Though solar sail missions are also being studied in the United States and in European countries, Japan will lead future solar system exploration using solar power sails with continuing this kind of mission," it added, saying that solar cells could help more generally with global warming or powering future satellites.